Came here for a quick weekend getaway with my husband. It was great! We stayed in a junior water-facing room (probably not the exact phrase for it.) The room was spacious (as was the bathroom) and tastefully decorated; it had a nice little balcony overlooking the marina, and the bed was SO comfortable. The lotion/shower gel/etc. they give you always smells aaaamazing. The hotel is really good with details: they have fresh fruit in the lobby; will build you a fire in the lobby-area fireplace; gave us free drinks at the bar in celebration of our wedding anniversary; and provides robes, chocolates, and a fridge in the room. There was also room service, which is always a plus for me. Everyone who works there is SUPER friendly. Even though we went in March and it was in the mid-40s, the outdoor pool was actually heated enough so you could swim, so that was fun! Having the indoor pool was great, though (I didn't last long outdoors! ), ditto the hot tub. One thing to note: when I was making our reservation, they gave me the option of a room with a fireplace, which would have been great, BUT they said it was right near the ballroom, which is under construction and therefore potentially noisy. So, when booking, I would ask them about that. It was really nice of them to tell me though! Literally my ONLY complaint is the shower water...Came here for a quick weekend getaway with my husband. It was great! We stayed in a junior water-facing room (probably not the exact phrase for it.) The room was spacious (as was the bathroom) and tastefully decorated; it had a nice little balcony overlooking the marina, and the bed was SO comfortable. The lotion/shower gel/etc. they give you always smells aaaamazing. The hotel is really good with details: they have fresh fruit in the lobby; will build you a fire in the lobby-area fireplace; gave us free drinks at the bar in celebration of our wedding anniversary; and provides robes, chocolates, and a fridge in the room. There was also room service, which is always a plus for me. Everyone who works there is SUPER friendly. Even though we went in March and it was in the mid-40s, the outdoor pool was actually heated enough so you could swim, so that was fun! Having the indoor pool was great, though (I didn't last long outdoors! ), ditto the hot tub. One thing to note: when I was making our reservation, they gave me the option of a room with a fireplace, which would have been great, BUT they said it was right near the ballroom, which is under construction and therefore potentially noisy. So, when booking, I would ask them about that. It was really nice of them to tell me though! Room tip: 230 had a really nice view and was quiet! Some rooms overlook the parking lot so if you care about views I'd definitely ask about that. I am so glad you enjoyed your getaway weekend with us. Our new Lighthouse Gallery (former ballroom) is now complete so come back when you can and try out the in room fireplace! Thank you for sharing your wonderful review and comments and I hope you will return soon to visit with us! What a beautiful hotel in an equally beautiful setting. Our room was spacious, comfortable and spotlessly clean. French doors opened onto the decking where we were able to enjoy fabulous views of the sunset and sunrise over the marina. We ordered room service which was delivered exactly when we wanted it. The food was delicious. The restaurant menu is full of choice and we wished we’d had more time to allow us to enjoy a meal there. We also wished we had booked more than one night to fully enjoy all that this wonderful hotel has to offer. We will definitely be back! Special thanks to Scott on reception who made us feel so welcome with just the right balance of warmth and professionalism. We cannot recommend this beautiful hotel highly enough. Thank you Saybrook Point Inn, for making the last day of our travels so memorable! Thank you so much for your glowing reviews. We are proud of what we offer through our facilities, our service and our food offerings. 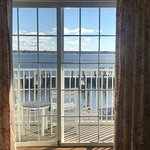 We also love to share these beautiful views of Long Island Sound and the Connecticut River. Thank you also for your comment about Scott. I have passed your kind words on to him. I hope you will come back and stay with us again soon! Nice hotel right on the marina. Room was large and very clean. Large bathroom with lots of space for everything and hooks to hang things. We had a late dinner at fresh salt and the food was very good. Thank you for your gracious comments. We are glad you enjoyed your stay and your late dinner here at our Award winning Fresh Salt Restaurant and we look forward to seeing you again soon. Thank you for the kind words regarding our Inn and Fresh Salt. We are glad you enjoyed your time with us and look forward to having you return again! What a lovely place to stay at. 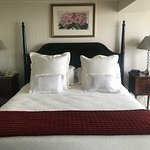 This older Inn is beautifully appointed and spotless. Our suite overlooked the marina and one of the pools. Such a pretty view.. The room had a super comfortable bed, a seating area, a balcony and a working fireplace. All of the .employees were very polite, talkative and friendly. The indoor pool, sauna, steam room and hot tub were all well maintained and easily accessible. I am so glad you enjoyed your stay with us and our incredible views. Please come back and join us again! The inn and its staff is absolutely fantastic. The views from our suite were great. The staff was very friendly. We felt right at home. 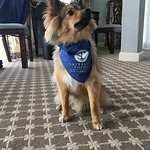 We traveled with our dog Teddy and he was spoiled by the staff the whole time we were there. We were provided with a list of dog sitters and it was recommended by the staff that we call Darci who happens to be the general Managers wife. She is a lovely women and we felt so comfortable leaving teddy with her and we knew he was happy! We will definitely be back to visit this great destination and it’s staff! Thank you for staying with us and bringing Teddy along. We loved meeting you and spoiling Teddy along the way! Many thanks also for the wonderful review. We hope to see you again soon!